Whether injured or spending loads of time in a office – you do not have to give up on your workout! We have come up with 5 sneaky and simple exercises that offer a full body workout. Safety precaution: Pay attention to your body during the movements — if anything hurts or causes pain, stop immediately. Seated jacks offer a great variation which provides you with just enough movement to spike your heart rate and burn calories. Quickly open legs out to sides, flexing feet and landing heels and extending arms overhead. The seated core twist is easy to do and is extremely beneficial as they help stabilise your torso, which results in the reduction of aches and pains in your lower back. The Cross Toe Touches (opposite toe touches) engages the core, inner thighs, arms and shoulders, all while raising your heart rate. Lean forward and twist your torso so that your straightened arms touch (come close) to the opposite foot. 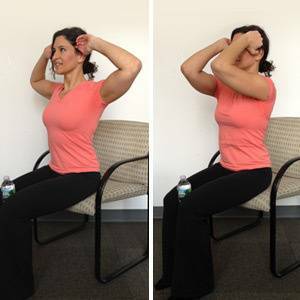 Seated running exercises are great for a cardio boost, and with the supporting muscles you will also activate your abs, arms and legs. Just like doing a sit-up seated elbow curls provide your core with a nice ‘crunch’. Bring your elbows together and bend forward and let your elbows touch your legs.